By Tom Gibbons, chief commercial officer of APiJET, a Seattle-based Smart Aircraft™ airline data service, and president of Aviation Partners 2, which builds on the benefits of blended and split-scimitar winglets to bring new efficiency-enhancing technology to airlines. The news is out. Press releases announcing APiJET, a joint venture between Aviation Partners and iJet Technologies, and our first full-fleet rollout went out on May 14. We also hosted a five-hour debriefing, demo and field trip for a select group of aviation editors and reporters. It was a big day for us. Hours before we launched APiJET.com, social media channels, and put signage on the doors of our downtown-Seattle offices. APiJET CEO John Schramm and I welcomed reporters and shared how we had come to this day. In John’s previous role as CEO of iJet Technologies, he had built a strong team and a much-needed service that had already found its first customer, Icelandair. 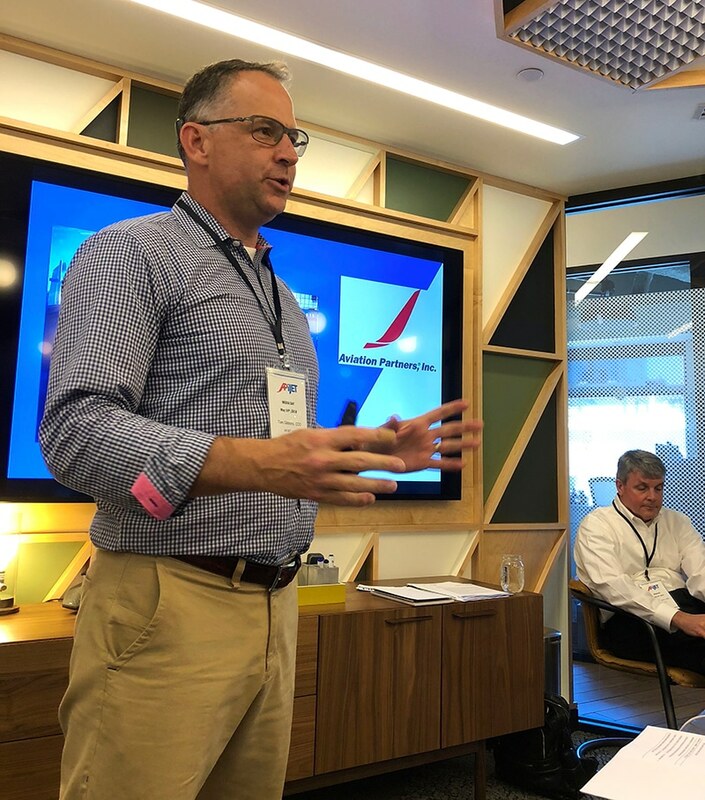 Myself (standing) and CEO John Schramm (seated) introduced our Smart Aircraft™ data service to Seattle, technology and aviation reporters during APiJET’s Media Day. Aviation Partners founder, Chairman and CEO Joe Clark convinced me to join his team in 2016 and charged me with finding the next big thing that would build on the returns airlines have achieved through the company’s aftermarket advanced winglet technology. That’s no small thing. To date, Aviation Partners Boeing has supplied winglets for more than 6,000 Boeing aircraft worldwide and has another 4,000 split winglets yet to do. Aviation Partners’ blended winglet technology now flies on more than 2,000 business jets. This winglet technology produces measurable benefits on an unheard-of scale for in-service aircraft, modernizing aircraft and upping their performance with superior climb and cruise. It also increases range, saves fuel and protects the environment. Passengers have even been known to request flying on aircraft with our winglets versus without. So, the bar had been set high. After months of due diligence on iJet Technologies, including a solo trip to Reykjavik where I personally met with Icelandair’s team, I became convinced that its real-time data, operations and health-monitoring service offered precisely what airlines need to realize the next big efficiency savings. Not only can the service be uniformly tailored to meet airlines’ specific parameters across fleets of varied ages and aircraft types, airlines own their data. Just as we now have smartphones and smart cars, the path to Smart Aircraft™ was revealing itself. 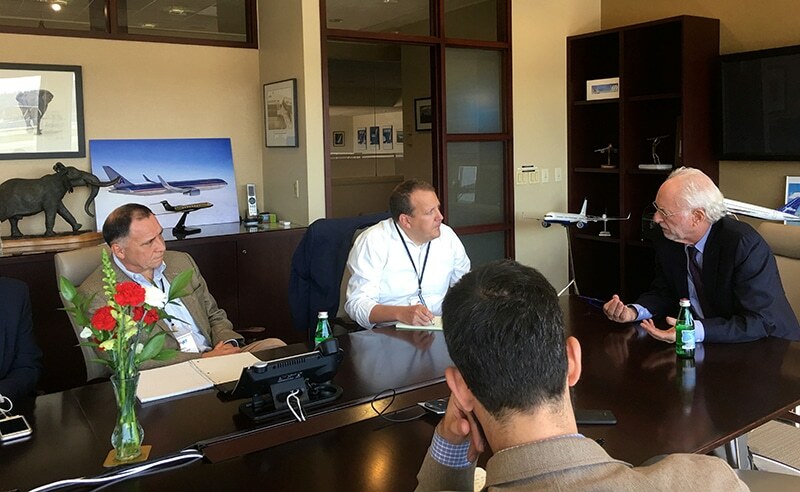 (left to right) Guy Norris, Aviation Week; Stephen Trimble, Flight Global; Joe Clark, Aviation Partners; and Jon Ostrower (front), the Air Current, talk about Aviation Partners and iJet Technologies’ joint venture during APiJET’s Media Day. 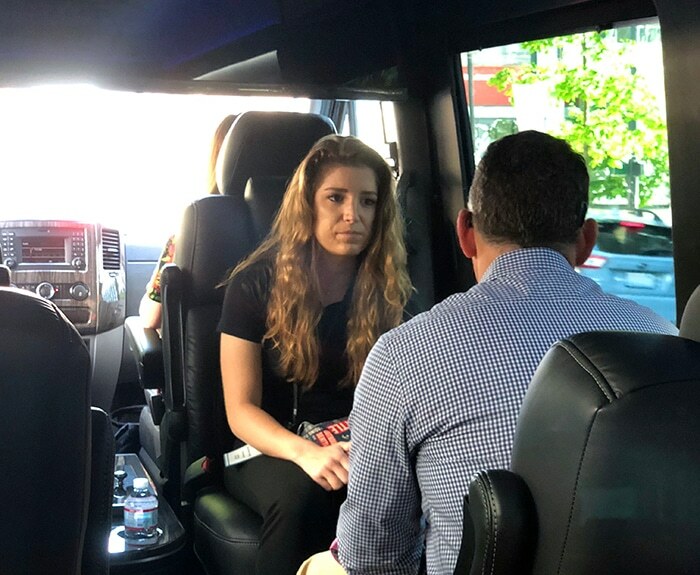 Alexa Rexroth, AIN, speaks with Tom Gibbons during APiJET’s Media Day. Puget Sound Business Journal Aerospace Writer Andrew McIntosh latched onto Schramm’s likening of Icelandair to the Oakland A’s of airlines, leveraging data analytics for a competitive advantage. General Manager Billy Beane’s use of player data to drive team decisions was popularized by the book (and subsequent movie), “Moneyball: The Art of Winning an Unfair Game.” Other airlines are expressing interest after Icelandair’s successful deployment across its 29-aircraft fleet and its resulting efficiencies. Aviation Partners’ majority ownership in APiJET goes beyond investment to include people and resources that can enable the joint venture to add a few more fleets this year. 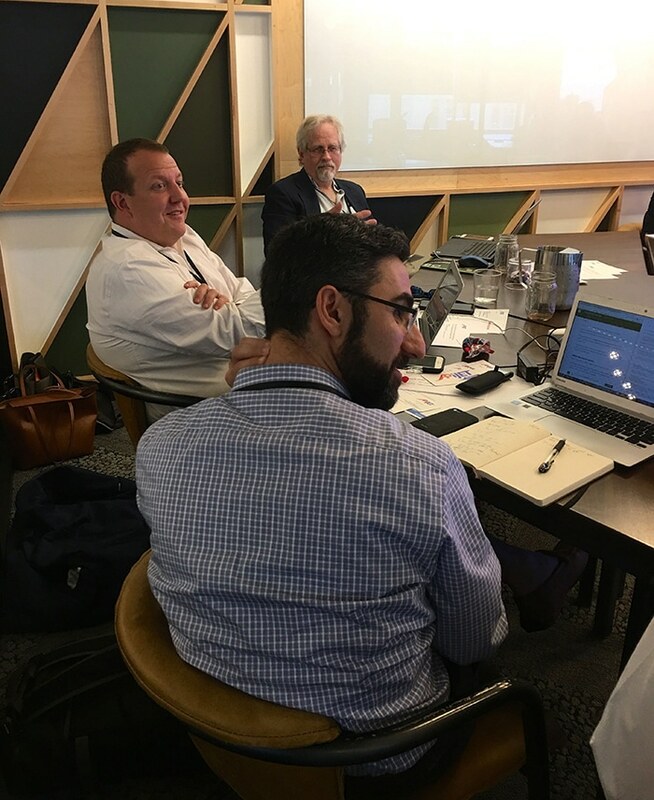 (from top to bottom of frame) Alan Boyle, Geekwire; Stephen Trimble, Flight Global; and Jon Ostrower, The Air Current attended APiJET’s Media Day May 14, 2018. We will have a presence at two international shows in June: the Airline & Aerospace MRO and Flight Ops IT Conference in Amsterdam and the International Air Transport Association (IATA) Aviation Data Symposium & AI Lab in Berlin. You can keep posted on our activities by following us on Twitter (@APiJET1), Facebook and LinkedIn – and hope you will.